Cuba reforms business laws, but not for professionals. Carlos Marquez is the owner of the paladar San Cristobal, where the Obamas dined in March. Cuban state employees are abandoning their jobs for high-paying, private-sector gigs—in Cuba. As bartenders, bellhops, and taxi drivers. The growth of the Cuban private sector over the past two decades has created some serious imbalances between skills and pay: A bartender with some generous foreign customers could make more in tips in a weekend than a doctor, each of whom is employed by the Cuban government, does in a month. A new reform could exacerbate that issue. Cuba will soon legalize small- and medium-size private businesses, according to an economic development plan approved by the Cuban Communist Party Congress last month. The 32-page document hit newsstands in Havana on Tuesday, according to the Associated Press, and offers the first glimpse of the reforms approved at April’s five-year CCP meeting. It comes on the heels of President Obama’s historic trip to Cuba in March, and the relaxing of the U.S. embargo. The CCP hasn’t released many details, but the plans have been the works for some time, says Richard Feinberg, a professor at the University of California–San Diego and the author of Open for Business: Building the New Cuban Economy. It will soon be possible for Cuba’s self-employed, known as cuentapropistas, to incorporate their operations, easing the way toward working with Cuban banks, foreign investors, and state-owned companies. Small businesses will be the vanguard of the market economy in Cuba, while bigger industries remain under state control. Some private enterprise—including small restaurants, guesthouses, construction trades, and taxis—is already legal in Cuba; a good deal more occurs on the margins of the law. About half a million Cubans have self-employment licenses; as many as a million Cubans may have some illegal or informal involvement in the private sector. “Up until now, the whole private sector was under something of a cloud—something that was tolerated, a way to sop up some unemployment,” Feinberg says. The CCP document, in contrast to your classic Fidelista pronunciations, affirms the positive contributions of private property. Capitalism! In some cases, anyway. Authorized private enterprise in Cuba currently includes the sale of food and drink, the production and sale of handcrafts, transportation, room rentals, construction, and some services. But private professional activities—anything that requires a college degree, basically—aren’t legal yet. Engineers and lawyers, for example, aren’t yet allowed to have their own practices. If they do have a side gig, it’s by operating without (or with an inaccurate) license and with the aide of mulas, who smuggle in supplies like printer ink from abroad. It’s not uncommon for a university professor to do tutoring in the evenings, or a state-employed architect to have his or her own clients outside the office. The 200-plus legal means of self-employment in Cuba are themselves severely restricted. Rules on property ownership would prevent the owner of a successful guesthouse, or casa particular, from buying the house next door, for example. 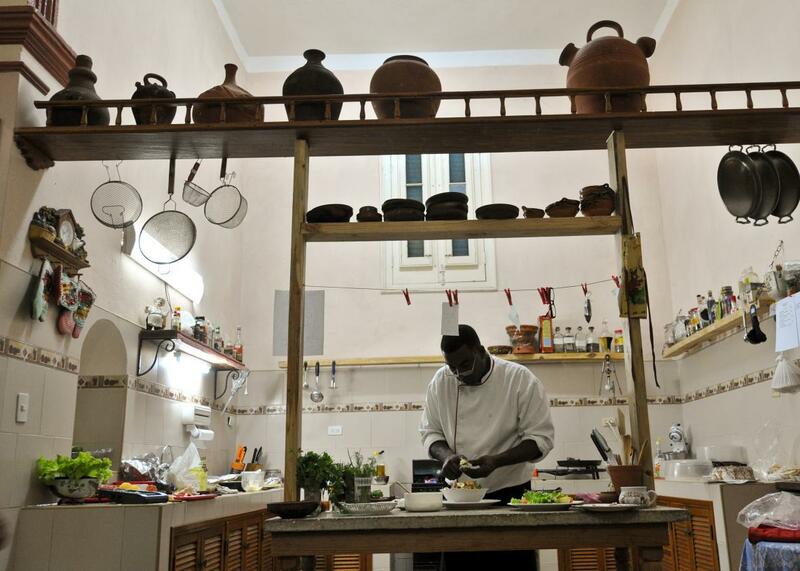 The owners of paladares, Havana’s chic private restaurants, make their own menus and set their own prices—but the state limits their size to 50 seats. When I visited Cuba last summer, one entrepreneur, who runs a hip private café amid the state-run tourist restaurants of Old Havana, told me he wasn’t even allowed to put up a sign outside. Still, tourism is where the money is. Most emerging opportunities for new business are directly or indirectly related to tourism, says Jorge Duany, the director of the Cuban Research Institute at Florida International University. Because of Cuba’s dual currency system—state wages are paid in Cuban pesos (CUP), while private businesses can take in the vastly more valuable convertible pesos (CUC)—the country has seen a flood of professionals into the private sector, and into tourism in particular. “People who have higher degrees are less remunerated than people with less education, who are able to participate in this growing private business sector,” Duany says. So the reforms will do two things: further liberalize the country’s existing, tourist-focused private sector, which is limited to a list of jobs proscribed by the government. That will help Cuba prepare to meet the growing influx of American tourists. (Already, there aren’t enough tables at Havana’s private restaurants to go around.) But it will also increase the flow of professionally trained Cubans into better-paying, nonprofessional employment. Is it a waste of a good socialized education to have economists giving tours and driving cabs? Probably. And it pays better too.